Wife of Esau (Gen. xxxvi. 2-16), thought by modern writers to be added by the final redactor (R) of the Pentateuch. Adah is said (verse 2) to be the daughter of Elon the Hittite. The priestly narrator (P) (Gen. xxvi. 34) has Judith, the daughter of Beeri the Hittite, as the corresponding wife. Dillmann is no doubt right in the opinion that the redactor had before him another source in which the names of Esau's wives differed from those given in the source employed by the priestly writer, and that his modification (Gen. xxxvi.) is due to this. 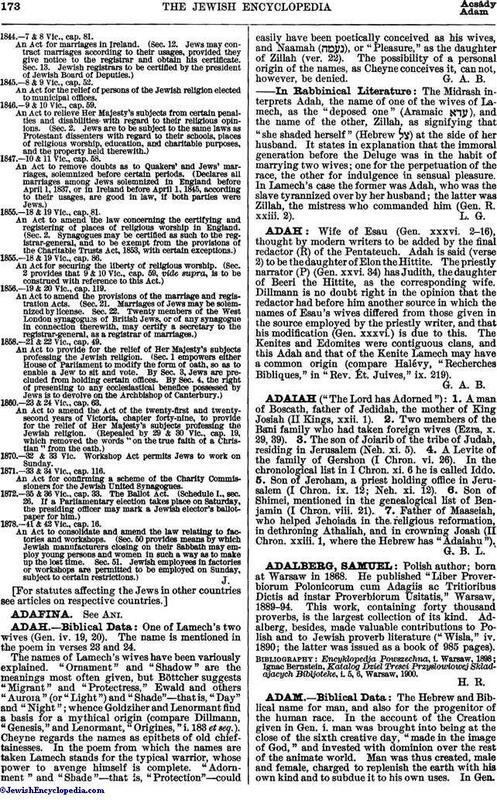 The Kenites and Edomites were contiguous clans, and this Adah and that of the Kenite Lamech may have a common origin (compare Halévy, "Recherches Bibliques," in "Rev. Ét. Juives," ix. 219).